Happy Mother’s Day, everyone! It’s the third biggest holiday next to Christmas and Easter, by some measures, although I have doubts that includes some non-Western holidays. However, if the world celebrated Mother’s Day, it would be easily the biggest holiday on the planet because we all have Mothers. Of course, we all have Fathers as well, but there aren’t nearly as many deliquent Moms as there are Dads so Mother’s Day would rule. It already does given Father’s Day doesn’t rank with Mother’s Day in the measure previously mentioned. This Mother’s Day, I get to wish Happy Mother’s Day to more Mothers I know than ever before. A sure sign I am getting older even though my body and mind don’t feel that way. I’d write about my Mother but she’d have my head for it as she’s just not that type of person… despite still being considered the matriarch of the Halifax area Vietnamese community after having left the city for seven years now. She earned her reputation herself, not by having others praise her. As a result, I am sharing some interesting facts from various websites about human, and the occasional animal, Mothers. Calculate your Mother’s salary (courtesy of Lifelessons4u blogger, who also pointed me to the video at the end). Anna Jarvis of Philadelphia began the campaign that brought about the official observance of Mother’s Day in the United states. She asked that white carnations be the official mother’s day symbol. The first Mother’s Day was celebrate on May 10, 1908, but was only made official in 1914 by President Woodrow Wilson. Just nine years later, though, Anna filed a lawsuit in an effort to stop the over-commercialization of Mother’s Day. She lost her fight. Now, cards, letters, candy and dinners out mark Mother’s Day for most families. Anna had hoped for a day of reflection and quiet prayer by families, thanking God for all that mothers had done. My Mother is very much in this philosophy, just hoping for a phone call and just allowing me a phone call, to be honest. Otherwise, she gets upset, and that’s not good to do to her on Mother’s Day, even if it’s out of good intentions to give her a gift. I always capitalize Mother (as well as Father), out of respect, whenever I write it… even if referring to Hitler’s or Osama bin Laden’s Mothers. Vietnamese is a patriarchal culture with the ultimate swear word being directed to one’s Mother because they all know who really runs the show. Chinese family names are often formed (begin) with a sign that means “mother”. It’s a nice way of honoring their Moms long past. There are 2 billion Mothers in the world (82.5 million in the U.S.). Median age of new Moms in the US is 24.8 vs. 21 in 1970. That means half the women who give birth for the first time are above this age and half are below. Research suggests that Moms who give birth later in life, live longer. 40% of births taking place annually in the US are the Mothers’ first. 55% of 15 to 44 year olds females are Mothers. 81% of 40 to 44 year old women are Mothers. In 1980, 90% of women in that age group were Mothers. Modern Moms average 2 kids (1950s: 3.5 kids; 1700s: 7-10 kids). 72% of Moms with children over 1 year old work (about the same as childless women) , vs. 39% in 1976. 55% of Moms with a child under 1 year old work, vs. 31% in 1976. 7,300 diaper changes by baby’s 2nd birthday. Moms take 2 minutes, 5 seconds (adds up to 3 40-hour work weeks each year!) to change diapers , vs. 1 minute, 36 seconds for dads… though quality of change might be another story! Preschoolers require Mom’s attention once every 4 minutes or 210 times / day. Preschooler Moms spend 2.7 hrs / day on primary childcare, vs. 1.2 hours for dads. 88% of laundry is done by Moms, totaling 330 loads of laundry & 5,300 articles of clothing each year. Vacuuming the stairs is the least favourite chore of Mothers. Mrs. Vassilyev of Russia gave birth to 69 children between 1725 and 1765, but only in 27 births. She had 16 pairs of twins, seven sets of triplets, and four sets of quadruplets. 67 of them survived infancy… and she was her husband’s first wife. Wonder why Father’s Day don’t compare to Mother’s Day for prominence? She probably also holds the highest average number of children per birth if you have something like a 3 births minimum. 1-in-31 are the odds of a woman delivering twins. Her odds of having triplets or other multiple births are approximately 1-in-539. There are 105 boys born for every 100 girls, though boys die off faster in teenage years due to more risk taking and live shorter lives on average so the balance is way in the other direction by retirement. 2.1 was the US total fertility rate (TFR) in 2006 — the first time since 1971 that the US’ TFR was at replacement level, which is the birth rate required to replace the population. 54% and 79% of children younger than 6 eat breakfast and dinner, respectively, with their Mothers every day. The corresponding percentages who eat with their Fathers were 41% and 66%. 68% of people in the United States plan to call Mom on Mother’s Day, totaling 122.5 million phone calls, which is more calls than any other day during the year! Mother’s Day is the busiest day for the year for restaurants. Most popular birth month is July & August (flip-flop year to year). Most popular birth day is Tuesday. Most popular birth date is October 5. Average weight gain during pregnancy is 30 lbs.A woman becomes pregnant most easily at the age of eighteen or nineteen, with little real change until the mid twenties. There is then a slow decline to age thirty-five, a sharper decline to age forty-five and a very rapid decline as the women nears menopause. When the female embryo is only six weeks old, it makes preparations for her Motherhood by developing egg cells for future offspring. When the baby girl is born, each of her ovaries carries about a million egg cells, all that she will ever have. Compare that to a female oyster who, over her lifetime, may produce over 100 million young. Of course, oysters take next to nothing to raise its young compared to humans (see below). $7,000 of baby items before 1st birthday. Middle-income families spend $242,070 to raise a kid to 18 (not incl. college!). A human baby takes longer and far more resources to raise than any other baby in the animal kingdom. It’s not even close, in fact! Many of the sweaters worn by Mr. Rogers on the popular television show, Mr. Rogers’ Neighborhood, were actually knitted by his real Mother (not his character’s Mother). The name of Snoopy’s Mother, which is from the Peanuts cartoon strip, is Missy. 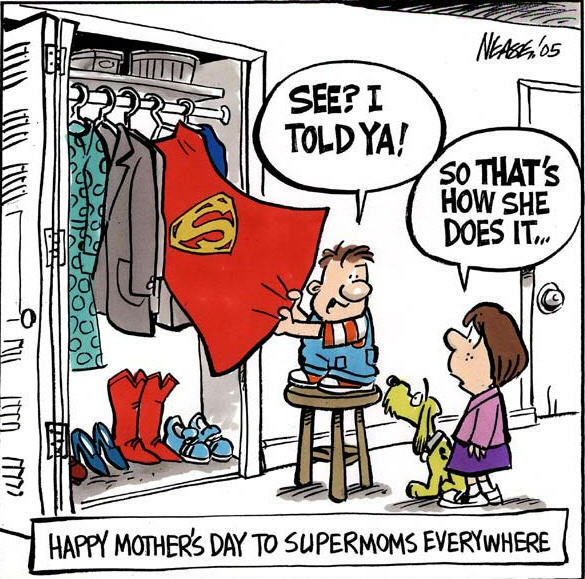 Any other interesting facts or insightful sayings about Mothers or Mother’s Day you know of and care to share?